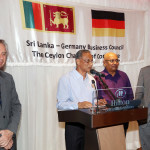 Mr. Ian Karan, a former Senator for Economic Affairs and Labour , City of Hamburg was in Sri Lanka recently and he addressed at a Breakfast meeting organized by Sri Lanka – Germany Business Council , The Ceylon Chamber of Commerce on Friday, 28th February 2014 at Kingsbury Hotel, Colombo. The former senator shared his views and experience on “What makes the German Economy the strongest in Europe and lessons we could learn from Germany “Mr.Karan is also the Founder of “Capital Lease” one of the largest container leasing companies worldwide and has more than 30 years experience in shipping industry. His Excellency Juergen Morhard, Ambassador of Germany in Sri Lanka , was the Guest of Honor at the event.